LOS ANGELES (AP) -- The United States won back the Walker Cup from Britain and Ireland in an unprecedented runaway that atoned for a big loss two years ago. 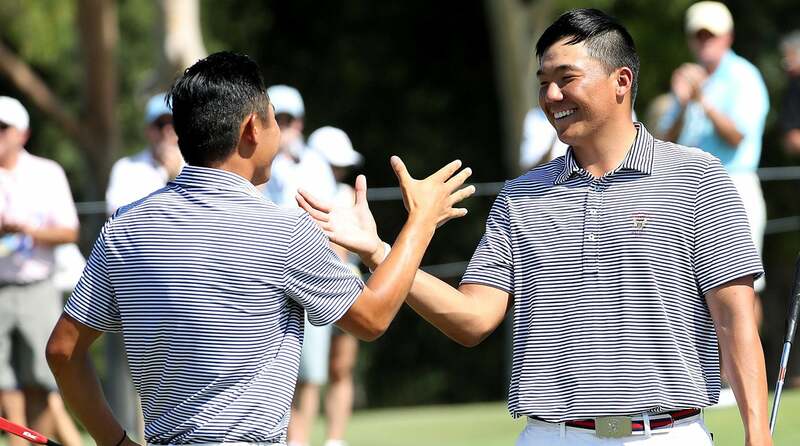 Collin Morikawa, Doug Ghim and Maverick McNealy each went 4-0 - a first for a team in Walker Cup history - to lead the United States to a 19-7 victory Sunday in the biennial amateur matches at the super exclusive Los Angeles Country Club's North Course. Norman Xiong, at 18 the youngest player in the competition, came painfully close to also going 4-0 before halving his match with Scott Gregory. Xiong, one of three Southern Californians who had huge performances this weekend, had been up 2 with two holes to play before Gregory caught him. It was a big turnaround from two years ago, when Britain and Ireland won 16 1/2-9 1/2 at Royal Lytham & St. Annes. The 19 points for the Americans matched the most ever in Walker Cup history. That came in 1993 when the United States won 19-5 at Interlachen. It was special for Morikawa in helping the United States extend its lead to 36-9-1 in a series that dates to 1922. Morikawa, who's from La Canada Flintridge and plays at California, beat British Amateur champion Harry Ellis 2 and 1 to cap his perfect weekend. "It's something special and you can't really explain what it is," Morikawa said. "I wasn't really nervous on the first tee, in the first shot for the U.S. on Saturday morning, but you just kind of are excited and thrilled that you can get out there and hit a tee ball for your country." Morikawa teamed with Xiong, who's from Canyon Lake, to win foursomes matches Saturday and Sunday mornings. Both won their singles matches Saturday afternoon. Morikawa was 2 down after three holes before winning four straight holes to take control. It helped, too, when Ellis bogeyed the par-3 11th. "I've never really gone undefeated in one of these team events, and just to have some momentum to know that I can do it against these guys, these guys are the best players around the country and the entire world, really," he said. Morikawa and Xiong got the rout going Saturday morning when they beat Ellis and Plant 8 and 7 in a foursomes match, the largest margin for an 18-hole match at the Walker Cup. Ghim, of Arlington Heights, Illinois, beat Matthew Jordan 3 and 1 in Sunday's singles. McNealy, of Portola Vallley in Northern California, topped Alfie Plant 4 and 2. Ghim and McNealy teamed up to beat Jordan and Robert MacIntyre in a morning foursome match. They also paired up to win a foursomes match Saturday as well as their singles matches. The United States went into the afternoon singles matches needing only 2 1/2 points to win the amateur biennial event. It got them quickly. Braden Thornberry of Ole Miss, the 2017 NCAA individual champion, rolled past Paul McBride, 6 and 5. With Xiong assured of halving his match, Stewart Hagestad, a junior member at LACC who played at Southern California, won 2 and 1 against Jack Singh Brar to clinch the competition. The rest of the matches contributed to the huge victory margin. The Americans won seven of 10 singles matches Sunday, with two being halved. McNealy was on the losing side two years ago. He said winning back the trophy was bigger than going undefeated. "I think it starts with the U.S. team getting that big trophy and that was our goal at the beginning of the week and I'm so excited to be part of the 2017 winning Walker Cup team," said McNealy, who played at Stanford. "That's what's most important to me. I'm so glad we could win this for our team, win this for Captain (Spider) Miller and win this for the country. "It's been unbelievable," he said. "I'll never forget this week. It's the end of my amateur career, but it means so much more than that to me," he added. Ghim was runner-up to Doc Redman at the U.S. Amateur last month at Riviera. "It feels great to be able to play it the way I wanted to," Ghim said. "I wasn't really sure how nervous I would be, but, I don't know, I felt really comfortable from the first tee shot on and just kind of rode the wave. I've been playing really well all summer and to end the summer with a week like this is so much fun." Britain and Ireland coach Andrew Ingram said the Americans were "superb all week." As for the rout, he said, "Today's been an, I guess back home we call it a bit of a hedgehog day. We couldn't get going. We couldn't get anything moving forward." LACC North, which sits between Beverly Hills and Westwood, with the high-rises of Wilshire Boulevard in the background, will host the U.S. Open in 2023.